Burst spiking in substantia nigra pars compacta (SNc) dopaminergic neurons is a key signaling event in the circuitry controlling goal-directed behavior. It is widely believed that this spiking mode depends upon an interaction between synaptic activation of N-methyl-D-aspartate receptors (NMDARs) and intrinsic oscillatory mechanisms. However, the role of specific neural networks in burst generation has not been defined. To begin filling this gap, SNc glutamatergic synapses arising from pedunculopotine nucleus (PPN) neurons were characterized using optical and electrophysiological approaches. These synapses were localized exclusively on the soma and proximal dendrites, placing them in a good location to influence spike generation. Indeed, optogenetic stimulation of PPN axons reliably evoked spiking in SNc dopaminergic neurons. Moreover, burst stimulation of PPN axons was faithfully followed, even in the presence of NMDAR antagonists. Thus, PPN-evoked burst spiking of SNc dopaminergic neurons in vivo may not only be extrinsically triggered, but extrinsically patterned as well. SNc dopaminergic (DA) neurons play a central role in modulating goal directed actions and habits, which are under the control of the basal ganglia. As such, a great deal of effort has been devoted to understanding what governs the activity of SNc DA neurons. The spiking behavior of these cells can be placed into one of two broad categories – a single spiking, low-frequency (<10 Hz) mode and a multi-spike, higher frequency, ‘burst’ mode (Grace and Bunney, 1984a, 1984b; Hyland et al., 2002). The single spiking mode is critical for maintaining ambient levels of DA in target structures, while the burst mode is thought to be a fundamental signal for action selection and reward-based learning (Schultz, 2007, 2016; Tsai et al., 2009). The single spiking mode of SNc neurons is generated by an intrinsic pacemaking mechanism involving the cooperation of a number of Na+, K+, and Ca2+ ion channels (Shepard and Bunney, 1988; Nedergaard et al., 1993; Chan et al., 2007; Puopolo et al., 2007; Guzman et al., 2009; Ding et al., 2011; Kimm et al., 2015). This behavior is preserved in the absence of synaptic input, and is observed in both dissociated and ex vivo brain slice preparations (Chan et al., 2007; Puopolo et al., 2007; Guzman et al., 2009; Ding et al., 2011). In contrast, burst spiking is lost in preparations lacking functionally intact synaptic connectivity (Shepard and Bunney, 1991; Johnson and Wu, 2004; Blythe et al., 2007) and is disrupted in vivo by local application of glutamatergic receptor antagonists (Grace and Bunney, 1984b; Charlety et al., 1991; Overton and Clark, 1992; Smith and Grace, 1992; Chergui et al., 1993), demonstrating the necessity of synaptic activity for the production of these events. Because local infusion of NMDAR antagonists in vivo reduced burst activity in anesthetized rodents (Overton and Clark, 1992; Chergui et al., 1993), subsequent studies have focused on the potential mechanisms by which NMDARs might generate naturally occurring bursts. 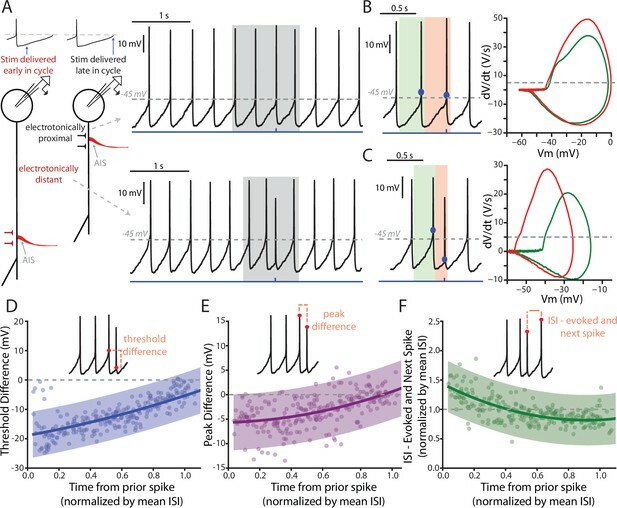 Indeed, NMDARs can amplify intrinsic oscillatory activity and promote the transition from slow, single spike pacemaking to a burst pattern (Wilson and Callaway, 2000; Kuznetsov et al., 2006; Deister et al., 2009; Kuznetsova et al., 2010; Ha and Kuznetsov, 2013). In contrast, α-amino-3-hydroxy-5-methyl-4-isoxazolepropionic acid (AMPA) receptors (AMPARs), the other ionotropic glutamate receptor found at SNc glutamatergic synapses, appear unable to produce burst activity like that observed in vivo (Shepard and Bunney, 1991; Johnson and Wu, 2004; Deister et al., 2009). However, local electrical stimulation of glutamatergic axons can induce burst-like spiking in SNc DA neurons that is dependent upon AMPARs (Georges and Aston-Jones, 2002; Blythe et al., 2007). One of the missing pieces in this story is an interrogation of specific glutamatergic inputs to SNc DA neurons. Rabies virus tracing studies have identified a handful of glutamatergic neurons that synapse on SNc DA neurons, including those in the subthalamic nucleus (STN), cerebral cortex, the superior colliculus and the pedunculopontine nucleus (PPN) (Watabe-Uchida et al., 2012). Of these, the PPN is of particular interest because of the strength of its projection to SNc and its connectivity with the rest of the basal ganglia (Clarke et al., 1987; Lavoie and Parent, 1994a, 1994b; Charara et al., 1996; Mena-Segovia et al., 2004; Martinez-Gonzalez et al., 2011). Interestingly, PPN neurons respond to environmental events in a way that resembles SNc DA neurons, including burst spiking in response to salient and rewarding stimuli, but at latencies shorter than those observed in DA neurons (Condé et al., 1998; Kobayashi et al., 2002; Pan and Hyland, 2005; Norton et al., 2011; Thompson and Felsen, 2013; Hong and Hikosaka, 2014). 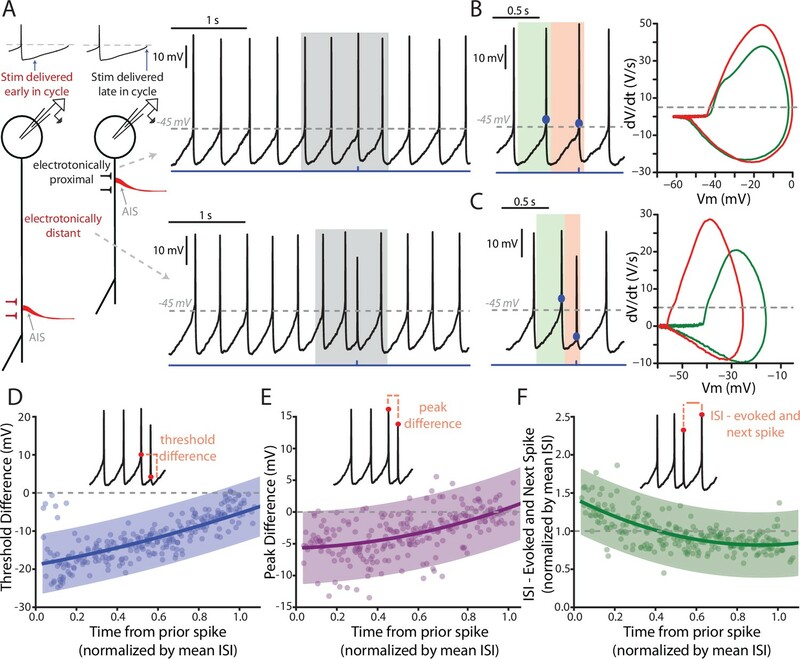 Moreover, activation of the PPN in vivo can evoke repetitive spiking in SNc DA neurons (Scarnati et al., 1984; Lokwan et al., 1999; Floresco et al., 2003; Hong and Hikosaka, 2014), and ablation of the PPN disrupts learning operant tasks (Inglis et al., 2000; Wilson et al., 2009; Bortolanza et al., 2010; Syed et al., 2016). Taken together, these observations suggest that PPN glutamatergic neurons might be able to generate patterned activity in SNc DA neurons, particularly bursts. To isolate the influence of PPN glutamatergic neurons on SNc, a combination of optogenetic and pharmacological tools were used. Subcellular optogenetic mapping revealed that PPN glutamatergic synapses were focused on the soma and proximal dendrites, near the axon initial segment. Indeed, stimulation of PPN axons reliably evoked spikes within SNc neurons at a variety of firing rates, including those observed in in vivo bursts. The ability of PPN axons to drive spiking was dependent solely upon AMPARs, not NMDARs. Thus, in addition to NMDAR-dependent forms of burst spiking, where the pattern of activity is dependent upon an interaction between synaptic and intrinsic mechanisms, the pattern of PPN-evoked burst spiking may be extrinsically determined. Injections of adeno-associated virus serotype 9 (AAV9) ChR2-eYFP driven by the human Synapsin I (hSyn) promoter were made in to the PPN of wild-type or DAT-Cre/Ai14-tdTomato mice (Figure 1A). Projections from the PPN to SNc were visualized ten days after injection (Figure 1B–C). To confirm functional expression of ChR2 in PPN neurons, whole-cell patch clamp recordings were performed on ChR2 expressing cells in the PPN (Figure 1—figure supplement 1A). Photo-stimulation of these cells with full-field (~360 µm diameter) blue light (473 nm) LED illumination reliably evoked photocurrents and associated action potentials (Figure 1—figure supplement 1B–C). Optogenetic stimulation of PPN afferents evokes glutamatergic responses in SNc DA neurons. (A) Stereotaxic injections of AAV9.hSyn.hChR2 were made in to the PPN of DAT-Cre/Ai14-tdTomato or wild-type mice. (B) Representative images taken from four sagittal sections from one DAT-Cre/Ai14-tdTomato mouse 10 days following injection of hSyn-ChR2-eYFP in to PPN. Scale bars represent 100 μm. (C) Expanded view of section (gray box) from (B3) showing ChR2-expressing PPN fibers (green) intermingled with SNc DA neurons (red). (D) Blue light LED stimulation produced an inward current in SNc DA neurons held at −70 mV that was abolished by the AMPAR antagonist NBQX (10 μM). (E) A 20 Hz paired-pulse stimulation protocol produced a depressing synaptic response in SNc DA neurons. (Right) Summary of PPR responses (0.83 ± 0.13, n = 10). (F) To determine AMPA:NMDA ratio cells were initially held at −70 mV to determine the timing of the AMPA peak (bottom trace), after which cells were depolarized to + 40 mV to relieve Mg2+ block of the NMDA receptor. The NMDA peak was calculated 40 ms after the AMPA peak. (Right) Summary of AMPA peak current vs. NMDA peak current (1.43 ± 0.42, n = 13). SNc neurons were identified in coronal or parasagittal ex vivo brain slices based on their morphology, location within the slice, and regular pacemaking activity (Lacey et al., 1989; Mercuri et al., 1994; Chan et al., 2007; Guzman et al., 2009). Glutamatergic responses were isolated by antagonizing GABAA (10 µM gabazine) and nicotinic cholinergic receptors (10 µM mecamylamine). Synaptic responses evoked with 1 ms full-field photo-stimulation of PPN ChR2 expressing afferents were recorded in SNc neurons held at −70 mV in the whole-cell patch-clamp configuration (Figure 1D). Paired-pulse stimulation (20 Hz) evoked responses with amplitude ratios less than one (Figure 1E; PPR = 0.83 ± 0.13, n = 10), indicating that the PPN glutamatergic synapse had a high release probability. This was confirmed with electrical stimulation of PPN afferents using a bipolar electrode placed in the rostral portion of PPN (Figure 1—figure supplement 2; PPR = 0.70 ± 0.16, n = 19). To determine the AMPA/NMDA ratio at these synapses, cells were first held at −70 mV to determine the time of the AMPA peak, and then held at + 40 mV to relieve NMDAR Mg2+ block. The NMDA current was measured 40 ms after the AMPA peak (Figure 1F). Measured in this way, the NMDAR current was roughly half that of the AMPAR current (peak AMPAR current/peak NMDAR current = 1.43 ± 0.42, n = 13). Next, the receptor subunit composition of the AMPARs and NMDARs was assessed. The majority of AMPARs in the brain contain edited GluA2 subunits, making them essentially impermeable to Ca2+ (Kawahara et al., 2003; Wright and Vissel, 2012; Henley and Wilkinson, 2016). In contrast to AMPARs lacking edited GluA2 subunits, these AMPARs do not rectify at depolarized membrane potentials (Koike et al., 1997; Washburn et al., 1997). At PPN synapses on SNc dopaminergic neurons, there was no discernible rectification at depolarized membrane potentials (Figure 2A), suggesting AMPARs at this synapse had edited GluA2 subunits. Furthermore, the polyamine toxin philanthotoxin-74, which preferentially antagonizes GluA2-lacking (GluA1 and GluA3 homomeric) AMPARs (Poulsen et al., 2014), failed to significantly reduce the AMPAR currents (Figure 2B), again indicating the presence of the GluA2 receptor subunit. Glutamatergic receptors at the PPN-SNc synapse are composed of GluA2-containing AMPARs and GluN2B/D-containing NMDARs. (A) Example traces of isolated AMPA currents evoked with the cell held at different membrane potentials. (Right) Summary current-voltage (IV) relationship, where the currents at the different membrane potentials for each cell have been normalized to the current measured at −80 mV for that cell. A linear fit was applied to the data points (represented as mean ± standard deviation). No obvious rectification is observed at positive membrane potentials. (B) Example traces of AMPA currents recorded from a DA neuron held at −70 mV before and after pharmacological manipulation. Application of philanthotoxin-74 (5 µM; red) did not attenuate the measured current as compared to control (black). NBQX (10 µM; blue) was applied to confirm the identity of the current. (Right) Summary of the effect of philanthotoxin-74 application (−13.17% ± 14.67%, n = 6). Summary data represented as mean ± standard deviation. No significant effect was observed (p=0.1563). (C) Example traces of isolated NMDA currents measured from DA neurons held at −60 mV in aCSF containing 0 Mg2+ before and after application of receptor-subunit specific pharmacological agents. (Left) The Glu2NB-selective antagonist ifenprodil attenuated the observed NMDA current, while (Middle) the Glu2NC/D-selective potentiator CIQ increased the peak of the measured current. (Right) The GluN2A-selective antagonist TCN 201 failed to attenuate the measured current. In all examples the nonspecific NMDAR antagonist CPP (5 µM) abolished the current, confirming its identity. (D) Summary of the effect, relative to control, on isolated NMDA currents of the GluN2B-selective antagonist ifenprodil (−43.31 ± 16.89%, n = 6), the GluN2C/D-selective potentiator CIQ (86.22 ± 56.54%, n = 6), and the GluN2A selective antagonist TCN201 (7.76 ± 18.40%, n = 6). Summarized data shown as mean ± standard deviation. Statistical tests were two-tailed Wilcoxon signed rank tests. *p<0.05. (E) 2PLSM calcium imaging of a PPN-evoked NMDA current and the associated calcium transient produced by that current. (Top) Example trace of a somatically recorded NMDA current produced by blue laser stimulation of a region of dendrite, visualized after filling the cell with a red indicator dye. (Right) Reconstructed cell generated, with a blue dot indicating both the point of stimulation and the general region where imaging data was acquired. (Bottom) Normalized (Δf/f0) calcium transient associated with somatic NMDA current. Shaded blue area represents region where green PMT was shuttered. Application of CPP (5 μM; red) abolished both the somatically recorded NMDA current (top) and the associated calcium transient (bottom). (F) Similar to (E), with the primary difference being that the evoked response is produced by the uncaging of focally applied RuBi-glutamate (2 mM) by blue laser light. (G) Summary of calcium transient areas from PPN-evoked (139.26 ± 56.40Δf/f0 * sec, n = 5) and uncaged RuBi-glutamate mediated (165.94 ± 40.27Δf/f0 * sec, n = 5) NMDA currents. No significance difference was found between the two data sets (p=0.4206). Summary data presented as mean ± standard deviation. Statistical test used was a two-tailed Mann-Whitney test. NMDARs are obligate heteromers composed of two GluN1 and two GluN2 subunits. The identity of the two GluN2 subunits significantly impacts properties of the receptor, such as sensitivity to Mg2+ block and relative Ca2+ permeability. While the majority of NMDARs in the brain contain a combination of GluN2A and GluN2B subunits (Monyer et al., 1994; Wyllie et al., 2013), previous work has shown that NMDARs in SNc DA neurons contain GluN2B and GluN2D subunits (Jones and Gibb, 2005; Brothwell et al., 2008; Suárez et al., 2010; Huang and Gibb, 2014), with the latter conferring reduced Mg2+ sensitivity and Ca2+ permeability (Siegler Retchless et al., 2012; Huang and Gibb, 2014). However, none of this work was done at identified synapses. To determine the subunit composition of the NMDARs at PPN synapses, currents were evoked by a single 1 ms full-field LED pulse with SNc cells held at −60 mV in the nominal absence of extracellular Mg2+. In agreement with previous work, both the GluN2B specific antagonist ifenprodil (Williams, 1993) and the GluN2C/D specific potentiator CIQ (Mullasseril et al., 2010) altered the amplitude of the evoked NMDAR currents (Figure 2C–D; ifenprodil % change: −43.31 ± 16.89, n = 6, p=0.0313; CIQ % change: 86.22 ± 56.54, n = 6, p=0.0313). In contrast, the GluN2A specific antagonist TCN 201 (Edman et al., 2012) had no effect on NMDAR currents (Figure 2C–D; % change: 7.76 ± 18.40, n = 6, p=0.4375). To determine whether Ca2+ entry through synaptic NMDARs differed from those that could be activated at neighboring dendritic regions, two-photon-excitation laser-scanning microscopy was used to image SNc dopaminergic neurons loaded with either 100 µm Fura-2 or Fluo-4 calcium indicator dye. 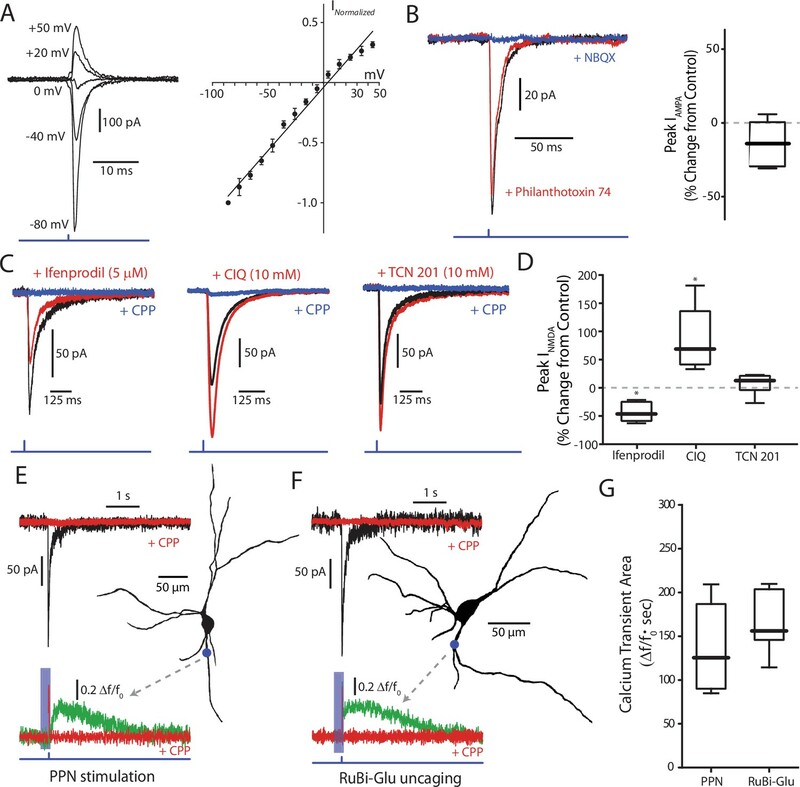 The fluorescent transient evoked by focal, dendritic optogenetic stimulation of PPN axons was compared to the transient evoked by uncaging of RuBi-glutamate in the same dendritic region (Figure 2E,F). The Ca2+ signal evoked by these two stimuli were not significantly different (Figure 2G). To determine the dendritic location of PPN synapses, the sCRACM approach was used (Petreanu et al., 2009; Fieblinger et al., 2014). Briefly, in ex vivo brain slices from mice in which ChR2 was expressed in PPN and where conducted activity was blocked by tetrodotoxin (1 µM), a focused laser (473 nm) spot was moved in 8–10 µm increments along dendrites while using the somatic electrode to monitor for synaptically evoked currents (Figure 3A–C). Neurons with dendrites above or below the focal plane were excluded from study to minimize the chances that synaptically evoked activity originated from a site other than the one visualized. In these experiments, photo-stimulation of proximal dendrites (within ~70 um of the soma) reliably evoked responses from PPN ChR2-expressing terminals, whereas photo-stimulation of more distal dendrites almost always failed to evoke a response (Figure 3A,E). PPN glutamatergic synapses preferentially target proximal portions of the SNc dendritic tree. (A) Schematic of the experimental procedure. Spots along a section of dendrite, visualized with 2PLSM imaging of dye-filled cells, were assessed for responses to focal spot-laser stimulation using the sCRACM technique. (B) Example reconstructed SNc DA neuron (top) with stimulation spots placed in approximately 10 μm along a section of dendrite that was wholly visualized in the same focal plane. (Bottom) Somatically recorded currents produced by focal stimulation of PPN synapses at the spots displayed above. Responses were elicited in the first 9 spots (~0 to 80 μm from soma), while more distal spots (>100 μm) failed to elicit responses. (C) Similar to (B), with the primary being that the afferents expressing ChR2 in this example originated from the STN, rather than the PPN. In contrast to (B) responses were reliably elicited at both proximal and distal locations. (D) Similar to (B) and (C), with the primary difference being that evoked responses were produced by uncaging of focally applied RuBi-glutamate (2 mM). Similar to (C), and in contrast to (B), response were elicited at in both proximal and distal dendritic regions. (E) Summary response frequency at points along the dendrite, measured as the fraction of cells that showed a synaptic response at a particular distance from the soma. 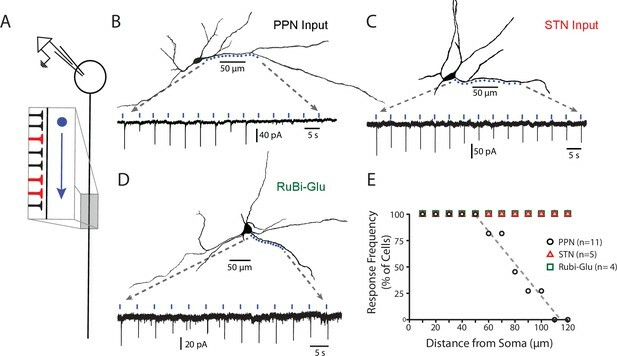 Responses recorded from DA neurons in slices expressing ChR2 in PPN afferents (n = 11) showed a location-dependent decrement in response frequency that was not observed in STN-ChR2 evoked responses (n = 5) or RuBi-glutamate mediated responses (n = 4). Two additional experiments were performed to provide positive controls. First, glutamatergic synapses formed by STN neurons were mapped using the sCRACMapproach. In contrast to PPN synapses, STN synapses were found in both proximal and distal dendrites (Figure 3C,E). Next, RuBi-glutamate was uncaged (single-photon photolysis) along the dendrite using a focused laser (473 nm) spot. Robust responses were evoked in both proximal and distal dendrites (Figure 3D,E), arguing that there was a relatively uniform distribution of glutamatergic synapses throughout the SNc dendritic tree, in agreement with previous anatomical work (Henny et al., 2012). Thus, the apparent preferential localization of PPN synapses on proximal dendrites does not reflect a limitation of the sCRACm approach or the inability to detect activation of glutamatergic synapses at distal dendritic locations. 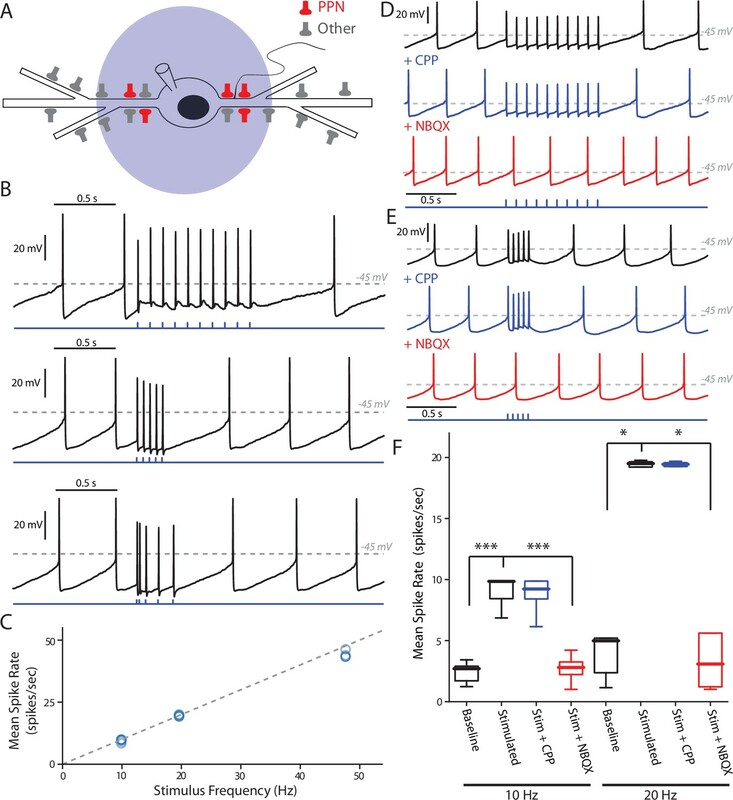 Previous work has shown that proximal glutamatergic synapses onto SNc dopaminergic neurons are better able to drive spiking than more distal ones (Blythe et al., 2009). 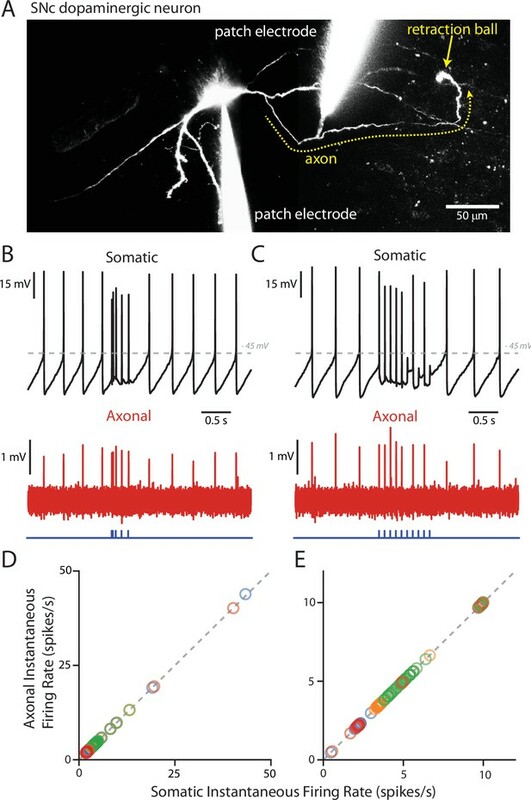 To determine the ability of proximal PPN synapses to drive patterned spiking, SNc dopaminergic neurons were recorded in the perforated patch mode and PPN axons stimulated optogenetically. The probability of evoking a spike in an SNc DA neuron rose rapidly with stimulus intensity (Figure 4—figure supplement 1). Using the lowest LED power that reliably evoked a spike (typically 6–10% of the LED maximum power), stimulus trains of varying length and frequency were delivered. In addition to regular trains, burst patterns similar to those recorded from SNc dopaminergic neurons in vivo were included (Grace and Bunney, 1984b). To ensure response fidelity for the higher-frequency (>10 Hz) stimulation protocols, the opsin Chronos was used in a subset of these experiments (Klapoetke et al., 2014). Regardless of the protocol used, optical stimulation of PPN axons reliably evoked spikes throughout the stimulus train (Figure 4A–B), with the average spike frequency within the stimulus period being linearly related (with a slope of 1) to the stimulus frequency (Figure 4C). PPN glutamatergic input is capable of patterning SNc DA neuron firing. (A) Full field blue-LED stimulation of ChR2-expressing PPN afferents was performed while recording spiking activity in SNc DA neurons using the perforated-patch configuration. (B) Example traces of different stimulation patterns: (Top) 10, 1 ms stimuli with an inter-stimulus interval of 100 ms, (Middle) 5, 1 ms stimuli with an inter-stimulus interval of 50 ms, and (Bottom) 5, 1 ms stimuli with inter-stimulus intervals of 20 ms, 50 ms, 100 ms, and 12 0 ms. In all cases spikes were reliably generated by the stimulation protocols. (C) Summary of the mean intra-stimulus spike frequency (spikes/s) as a function of the frequency of stimulation. The measured spike frequency was linearly related to the stimulation frequency in a near 1:1 relationship. (D) Example traces from a SNc DA neuron responding to the 10 stimuli, 10 Hz PPN ChR2 stimulation protocol before and after pharmacological manipulation. Application of the NMDAR antagonist, CPP (5 μM), did not significantly attenuate the response to PPN stimulation, while application of the AMPA receptor antagonist, NBQX (10 μM) completely abolished the evoked response. (E) Similar to (D), with the primary difference being the usage of the 5 stimuli, 20 Hz PPN stimulation protocol. As with (D), application of CPP failed to attenuate the response, while NBQX completely abolished the response. (F) Summary of pharmacological manipulation of SNc DA neuron firing pattern response to PPN stimulation. Both 10 Hz (9.03 ± 1.19 spikes/s, n = 9) and 20 Hz (19.53 ± 0.25 spikes/s, n = 5) stimulation significantly increased firing rate in comparison to control (10 Hz stim: 2.40 ± 0.82 spikes/s, n = 9, p=0.0001; 20 Hz stim: 3.43 ± 1.90 spikes/s, n = 5, p=0.0117). CPP application failed to significantly decrease the response to stimulation (10 Hz stim: 8.81 ± 1.55 spikes/s, n = 5, p=0.8413; 20 Hz stim: 19.49 ± 0.19 spikes/s, n = 5, p=1.0). In contrast, NBQX application significantly attenuated the PPN evoked response (10 Hz stim: 2.71 ± 1.10 spikes/s, n = 6, p=0.0008; 20 Hz stim: 2.73 ± 2.25 spikes/s, n = 5, p=0.0234). Summaries are presented as mean ± standard deviation. Statistical tests used were two-tailed Mann-Whitney tests with Holm-Bonferroni corrections for multiple comparisons. ***p<0.001, *p<0.05. To determine whether NMDARs contributed to the ability of PPN axons to drive burst spiking, a pharmacological approach was used. Surprisingly, application of the NMDAR antagonist CPP, did not significantly alter the response to PPN stimulation at any frequency (Figure 4D–F). In contrast, application of the AMPAR antagonist NBQX completely abolished responses (Figure 4D–F), indicating a dependence on AMPARs, but not NMDARs. Frequently, PPN-evoked spikes were truncated in amplitude and had a more hyperpolarized threshold than spikes that were spontaneously generated (e.g., Figure 4B). These likely represent axon initial segment (AIS) spikes that failed to invade the somato-dendritic (SD) region where the electrode was positioned (Grace and Bunney, 1980, 1983a, 1983b). Indeed, previous work has shown that antidromically-evoked AIS spikes often fail to generate full SD spikes in SNc DA neurons (Grace and Bunney, 1983b). The ability of AIS spikes to evoked full SD spikes should be dependent upon the excitability of the SD region, which should be determined by ongoing pacemaking. To test this hypothesis, individual spikes were evoked by optical stimulation of PPN axons at different points in the pacemaking cycle (Figure 5A). When the stimulus occurred towards the end of normal pacemaking cycle, the evoked spikes were indistinguishable from spontaneously occurring spikes (Figure 5A–B). In contrast, when spikes were evoked early in the oscillation, just after a spontaneously occurring spike, they exhibit more hyperpolarized spike thresholds and reduced amplitudes, as evident in plots of the first derivative of membrane voltage (dV/dt) as a function of membrane voltage (mV) (Figure 5A,C). Plots of PPN-evoked spike threshold and amplitude as a function of the time from the preceding spike, normalized by the average interspike-interval (ISI) of the spikes preceding the stimulus (4 s worth of recording) revealed this relationship more clearly (Figure 5D–E). PPN-evoked spikes early in pacemaking cycle (i.e. near time = 0) had hyperpolarized thresholds and reduced amplitudes, whereas spikes evoked near the end of the pacemaking cycle were identical to spontaneously occurring spikes. Also, in agreement with previous work (Guzman et al., 2009), PPN-evoked spikes reset the pacemaking cycle, as indicated by a clustering of points around one when comparing the ISI between the evoked spike and the next spontaneously occurring spike to the mean ISI for the cell (Figure 5F). Features of PPN-evoked spikes depend on the phase of SNc DA neuron pacemaking cycle. (A) Schematic representation of two points in the pacemaking cycle. As the cell nears threshold towards the end of pacemaking cycle it ‘tightens up’ in preparation of spiking. This manifests as an apparent shortening of the distance between the source of AP generation, the AIS, and the somatic recording electrode due to a longer length constant. Consequently, the evoked spike (Top) appears qualitatively similar to the spontaneously generated APs. In contrast, early in the oscillation cycle the cell is particularly ‘leaky’, resulting in a small length constant and consequently a spike that appears qualitatively different when recorded at the soma (Bottom). (B) Comparison of the PPN evoked spike (red) to the spike preceding the evoked spike (green). Representative spikes are expanded from the shaded region in A. Phase plots (Right), generated from respective green and red shaded regions (left), for the two spikes appear similar, with nearly identical thresholds (determined at the point when the dV/dt exceeds 5 V/S – that is the gray dashed line in the phase plot). (C) Similar to (B), with the primary difference being the point in the pacemaking cycle where the stimulus occurred. There is a significant shift in the threshold of the evoked spike, as observed by a leftward shift in its associated phase plot (Right, red). (D–F) Summaries of three properties of the evoked spike: threshold difference (in comparison to the preceding spike), peak difference (in comparison to the preceding spike), and inter-spike interval between evoked spike and the next spontaneously generated AP. Oscillation phase is represented as time to the stimulus from the preceding spike, normalized by the mean ISI for all the spikes preceding the stimulus (averaging window = 4 s). In (D) and (E) during the early phase of the oscillation (near t = 0) there is a large deviation in measured spike threshold and spike peak in comparison to the preceding spike. This difference diminishes at t approach 1. In (F), except for at the earliest time points the normalized ISI values largely cluster around 1, indicating a resetting of the pacemaking cycle. Fit lines are second-order polynomials, with shaded areas representing 95% confidence intervals. Although PPN-evoked spikes were not strongly influenced by somatic conductances, they should be regulated by dendritic conductances because of the common dendritic location of the AIS (Blythe et al., 2009; Matsuda et al., 2009). One well described dendritic channel that slows repetitive spiking in SNc DA neurons is the small conductance, Ca2+-activated K+ channel (SK) (Ping and Shepard, 1996; Wolfart et al., 2001). Indeed, in addition to accelerating pacemaking rate, blocking SK channels with apamin increased the ability of PPN terminals expressing ChR2 to evoke faithful, repetitive (10 Hz) spiking at low stimulus intensities (Figure 5—figure supplement 1). Interestingly, PPN stimulation in the presence of apamin delayed the next spontaneously occurring spike, rather than simply resetting the pacemaking rhythm (Figure 5—figure supplement 1). As mentioned above, the AIS typically arises from a proximal dendrite in SNc DA neurons (Blythe et al., 2009; Matsuda et al., 2009), in the region where PPN synapses were found. Thus, it was possible that PPN-evoked spikes, even though they often appeared truncated at the soma, would be faithfully propagated down the axon. To test this hypothesis, paired recordings were performed from the soma and from the axon. First, a somatic whole cell recording was established and the cell filled with dye to allow visualization of the dendrites and axon. The axon was identified by the presence of a retraction ball (Atherton et al., 2008; Blythe et al., 2009). Once identified, a second pipette was used to record from the axon in a loose-seal configuration. Recordings were then simultaneously made of both spontaneous and evoked spikes from the soma and axon (Figure 6B–C). Spontaneously recorded somatic spikes invariably propagated into the axon, as expected. More importantly, PPN-evoked spikes were also invariably seen in the axon, regardless of the phase of the pacemaking cycle and the somatic appearance of the spike (Figure 6B–C). Plotting the instantaneous spike frequency within the axon as a function of the instantaneous spike frequency in the soma confirmed this relationship (Figure 6D–E). Failure of the somatically recorded spikes to invade the axon would lead to points below the linear trend line, but this was not seen as all somatic spikes showed corresponding axonal spikes (Figure 6D–E). This finding is in agreement with previous work showing that AIS spikes alone are capable of triggering axonal firing (Grace and Bunney, 1983b). PPN-evoked spikes reliably invade the axon. (A) Reconstruction of an example cell where two recording electrodes are clearly visible. Paired recording were made in order to simultaneously measure evoked spikes at the soma and at the axon. Axons (yellow dashed line) were identified based upon the presence of a retraction ball (yellow arrow) following the filling of the cell with dye via the somatic electrode. After identification, loose-seal recordings were made of spike activity in the axon. (B) Example recording of somatic whole-cell (Top) and axonal loose-seal (Bottom) recordings of spontaneous and stimulated (5, 1 ms stimuli with variable inter-stimulus interval protocol) action potentials. Spikes recorded at the soma are mirrored by events in the axon. (C) Similar to (B), except for the application of a different stimulation protocol (10, 1 ms stimuli with an inter-stimulus interval of 100 ms). (D–E) Plot of the instantaneous spike rate (spikes/s) of APs recorded in the axon as a function of the instantaneous spike rate (spikes/s) of APs recorded in the soma. Points fall along a linear, 1:1 relationship (gray dashed lines), indicating reliable representation in the axonal recordings of spike events also recorded in the soma. (D) are data points from the variable inter-stimulus interval protocol; (E) are data points from the 10 Hz stimulation protocol. Different colors represent different cells (n = 4). Burst spiking in SNc DA neurons is a critical signal for goal-directed behavior (Schultz, 2007; Tsai et al., 2009; Bromberg-Martin et al., 2010; Schultz, 2016). While dependent upon synaptic activity (Grace and Bunney, 1984b; Overton and Clark, 1992; Smith and Grace, 1992), the cellular mechanisms dictating the temporal structure of the burst are poorly understood. The most widely held view is that bursts are produced by intrinsic oscillatory mechanisms engaged by activation of dendritic NMDARs (Esposito et al., 2009; Morikawa and Paladini, 2011; Paladini and Roeper, 2014). Our results expand this landscape to include an additional mechanism by which bursts can be generated. In particular, they show that bursts could be produced by patterned stimulation of PPN synapses formed on proximal dendrites near the AIS. Engagement of NMDARs was not necessary for burst generation in this case. Moreover, in contrast to the conventional model, this mechanism allows bursts to be generated and structured independently of ongoing pacemaking activity or synaptic input to more distal dendrites, like that arising from tonic activity in pallidal and nigral GABAergic neurons. Being able to precisely control the timing and duration of bursts could prove to be important to movement control, particularly that triggered by external events. Our experiments provide the first characterization of the receptor complement at PPN glutamatergic and the sub-cellular distribution of these synapses on SNc DA neurons. Optogenetic approaches allowed the selective activation of axons originating in the PPN. Pharmacological tools allowed the receptor subtypes at these synapses to be determined. As in most adult glutamatergic synapses, the AMPARs at PPN synapses were Ca2+-impermeable, as judged by their lack of rectification and insensitivity to philanthotoxin-74. Moreover, as expected from previous work examining NMDARs at unidentified synapses (Jones and Gibb, 2005; Brothwell et al., 2008; Suárez et al., 2010), the NMDARs at PPN synapses were GluN2B/D containing. More specifically, the magnitude of the NMDAR block achieved by ifenprodil was that expected of a triheteromeric, GluN2B/D containing receptor (Hatton and Paoletti, 2005; Huang and Gibb, 2014). 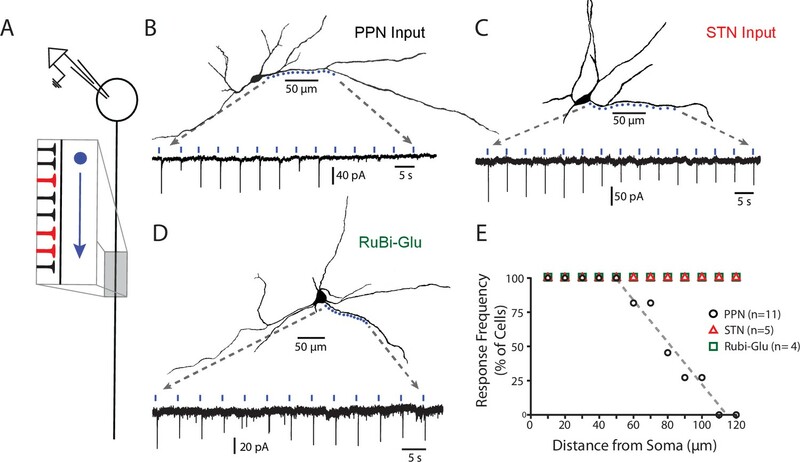 The ability of the GluN2C/D potentiator (CIQ) to increase NMDAR currents further supports the proposition that triheteromic GluNB/D containing receptors are present at this synapse (Jones and Gibb, 2005; Huang and Gibb, 2014). Although the composition of ionotropic glutamate receptors at PPN synapses was expected, their sub-cellular distribution, as revealed by the sCRACM technique (Petreanu et al., 2009; Fieblinger et al., 2014), was not. In contrast to the broad distribution of postsynaptic glutamate receptors and STN synapses, PPN glutamatergic synapses were found only on proximal dendrites. This location specificity places these synapses near the AIS, which typically arises from proximal portions of a primary dendrite (Blythe et al., 2009; Matsuda et al., 2009). It remains to be determined whether synapses made by other glutamatergic regions innervating the SNc (e.g., superior colliculus) have a similar distribution. The positioning of PPN glutamatergic synapses on proximal dendrites near the AIS should maximize their ability to control spike generation. Indeed, at low optical stimulation intensities, SNc DA neurons faithfully followed the pattern of PPN stimulation, even at high frequencies. This behavior suggests that PPN synapses near the AIS are capable of driving spike generation independently of NMDARs. The AIS origin of the PPN evoked spikes was consistent with several features of the somatic recordings, including the dependence of the nominal spike threshold and amplitude on the phase of the pacemaking cycle and the faithful propagation of evoked spikes down the axon. Although focal optical stimulation of dendrites that did not bear the AIS might have evoked dendritic spikes that would have manifested greater dependence on the pacemaking cycle, it remains to be determined whether individual PPN axons have terminal fields that are restricted to a single dendrite or diverge to contact several dendrites, including the AIS bearing one. The degree of PPN convergence on individual SNc DA neurons also is uncertain. Optogenetic stimulation artificially synchronizes spiking in PPN axons, producing a temporal summation of synaptic inputs that may not occur in vivo. This could lead to an over-estimation of the ability of PPN to control the patterning of SNc DA neuron spiking, particularly bursting. However, it is possible that individual SNc DA neurons are innervated by a small number of PPN axons; in this case, synchronization of inputs becomes much less of a concern. The steep relationship between optical stimulus intensity and SNc DA neuron spike probability is consistent with this possibility. This kind of mapping between PPN and SNc would provide an explanation for the variability in SNc burst patterns observed in vivo (Grace and Bunney, 1984b; Hyland et al., 2002). However, to definitively answer this question, anatomical approaches will be needed. One possibility is single cell mapping experiments using tracer fills of individual PPN axons. Alternatively, a rabies-based retrograde tracing could be employed by generating a sparse starter populations within the SNc (Wickersham et al., 2013). Regardless, these experiments demonstrate that PPN glutamatergic synapses are capable of determining the precise timing of SNc DA neuron spikes that are propagated down the axon to target structures, like the striatum. Moreover, PPN synapses were capable of driving precisely structured bursts, like those recorded in vivo (Grace and Bunney, 1984b). This result is consistent with previous studies showing that focal application of glutamate to proximal dendrites, as well as local electrical stimulation of glutamatergic axons, was capable of producing spike bursts (Blythe et al., 2007, 2009). Thus, there appear to be two general mechanisms by which spike bursts can be generated in SNc DA neurons. In contrast to the PPN-driven mechanism, previous studies have shown that local application of glutamate can evoke bursts that depend upon activation of NMDARs (Johnson and Wu, 2004; Deister et al., 2009). In vivo, SNc DA neuron burst spiking can be attenuated by NMDAR antagonists (Charlety et al., 1991; Overton and Clark, 1992; Smith and Grace, 1992; Chergui et al., 1993) or genetic deletion of NMDARs (Zweifel et al., 2009). Similarly, stimulation of the STN in vivo increases burst firing in SNc DA in an NMDA-dependent (Smith and Grace, 1992; Chergui et al., 1994). The bursts generated in this way harness the intrinsic oscillatory mechanisms of dendrites (Deister et al., 2009; Kuznetsova et al., 2010; Ha and Kuznetsov, 2013). The dependence upon intrinsic oscillatory mechanisms will undoubtedly allow pacemaking and ongoing synaptic input, particularly GABAergic synaptic activity, to influence the timing of bursts, contrasting it with the ‘short-circuiting’ of these processes by PPN synapses. Another interesting feature of the NMDAR-dependent burst is its dependence upon the voltage-dependence of Mg2+ block. Using the dynamic clamp technique, Deister et al. (2009) showed that removal of NMDAR voltage sensitivity associated with Mg2+ block abolished burst firing. Given that tri-heteromeric GluN1-GluN2B-GluN2D NMDARs found at PPN synapses have lower Mg2+ sensitivity (Huang and Gibb, 2014), it could be that more distally located NMDARs have a different subunit composition that enhance their ability to promote bursts. Lastly, it is unclear to what extent extra-synaptic NMDARs play a role in burst generation. Given the differences in postsynaptic signaling by synaptic and extrasynaptic NMDARs (Hardingham and Bading, 2010; Paoletti et al., 2013), the differential engagement by the two different modes of burst generation could have important long-term consequences. There are several lines of evidence suggesting that the PPN exerts a strong control over DA neuron spiking in vivo. For example, stimulation of the PPN in vivo produces a significant increase in bursting in ventral tegmental area (VTA) DA neurons and dopamine release in the nucleus accumbens (Floresco et al., 2003). Moreover, lesioning the PPN disrupts dopamine-dependent learning in a variety of behavioral tasks (Inglis et al., 2000; Alderson et al., 2008; Bortolanza et al., 2010; Jimenez-Martin et al., 2015; Syed et al., 2016). Recordings in behaving animals have shown that PPN neurons code for predicted reward value, reward magnitude and stimulus salience (Pan and Hyland, 2005; Kobayashi and Okada, 2007; Okada et al., 2009; Norton et al., 2011; Okada and Kobayashi, 2013). Often, the activity in PPN precedes that in SNc (Pan and Hyland, 2005; Kobayashi and Okada, 2007; Okada et al., 2009), raising the possibility that signals from the PPN are critical for the computations performed by DA neurons. In addition to reward signaling, recent work has implicated PPN glutamatergic neurons in the control of movement gated by the striatum (Roseberry et al., 2016). Our results show that this activity provides a potent excitation of SNc DA neurons that may be important to modulating striatal circuits controlling movement sequences. This inference is consistent with the observation that phasic activity in SNc DA neurons is temporally correlated not only with the outcomes of actions, but action itself (Howe and Dombeck, 2016). Precisely what is being coded by PPN activity influencing SNc and how this translates into the pattern of SNc spiking remains to be determined by in vivo experiments (Hong and Hikosaka, 2014). Nevertheless, it is tempting to speculate that the basal ganglia control of PPN glutamatergic neurons described by Roseberry et al. (2016) is fed back to the SNc and broadcast to the striatum, allowing complex movement sequences to be executed – a capacity that is lost in PD patients with degeneration of SNc DA neurons (Hernández et al., 2015). Our studies identify a novel mechanism for burst generation in SNc DA neurons. Glutamatergic innervation of the SNc by the PPN was found to preferentially target proximal regions of the SNc dendritic tree, near where the AIS of these cells generally originates, placing these synapses in a favorable location to drive spiking. In contrast to the previously described mechanism involving the cooperation of intrinsic oscillatory activity with NMDAR activation to generate bursts in SNc neurons, activation of PPN fibers was capable of directly patterning SNc neuron spiking independently of regular pacemaking activity and without the need to engage NMDARs. Further examination is required to determine whether this mechanism generalizes to other sources of glutamatergic input to SNc neurons. Nevertheless, this work indicates the PPN is a likely source of extrinsic control of SNc neuron firing during goal-directed behavior. Male and female C57Bl/6J (Jackson Laboratory, Bar Harbor, ME, Stock #000664) or DAT-Cre/Ai14-tdTomato (on a C57Bl/6J background) mice were used. The latter were generated in-house using DAT-Cre (Slc6a3tm1.1(cre)Bkmn – Jackson Laboratory, Stock #006660) and Ai14 (Gt(ROSA)26Sortm14(CAG-tdTomato)Hze – Jackson Laboratory, Stock #007908) mice. All experiments were performed in accordance with protocols reviewed and approved by the Northwestern Institutional Animal Care and Use Committee and NIH guidelines. Stereotaxic injections were performed when animals were between P16 and P25 days old. Animals were anesthetized with an isoflurane precision vaporizer (Smiths Medical PM, Inc., Norwell, MA) and placed in a stereotaxic frame (David Kopf Instruments, Tujunga, CA). The distance between bregma and lambda was measured and used to adjust the following stereotaxic coordinates: PPN – AP: −4.4, ML: 1.25, DV: 3.5; STN – AP: −1.8, ML: 1.4, DV: 4.5. A small hole was drilled using a micro drill bit (Fine Science Tools, Foster City, CA) and a calibrated glass pipette pulled on a P-97 Sutter Instruments (Novato, CA) puller was used to inject 40–60 nL of either AAV9.CAG.hChR2, AAV9.hSyn.hChR2, or AAV9.Syn.Chronos (Addgene 20938M, Addgene 26973P, or Addgene 62726, respectively, supplied by University of Pennsylvania Vector Core) at one of these locations. Animals were sacrificed 10–20 days post injection. Mice were anaesthetized with a mixture of ketamine (50 mg/kg) and xylazine (4.5 mg/kg) and intracardially perfused with ice-cold high-sucrose, high-magnesium artificial cerebrospinal fluid (aCSF) containing (in mM): 50 NaCl, 2.5 KCl, 25 NaHCO3, 1.25 NaH2PO4, 1 CaCl2, 10 MgCl2, 25 glucose, pH 7.3 (~310 mOsm/L). The brain was then removed, sectioned in to 220–275 µm coronal or parasagittal slices using a Leica VT1200 S vibratome (Wetzlar, Germany), and allowed to recover at room temperature for at least 30 min in aCSF containing (in mM): 82.5 NaCl, 2.5 KCl, 25 NaHCO3, 1.25 NaH2PO4, 1.5 CaCl2, 5.5 MgCl2, 25 glucose, pH 7.3 (~310 mOsm/L). All solutions were oxygenated with a mixture of 95% O2/5% CO2. Patch pipettes were pulled from thick-walled borosilicate glass on a Sutter P-1000 puller. Pipette resistance was typically 3–4 MΩ, except for whole cell pacemaking and cell-attached axon recordings where pipette resistance typically was 8–15 MΩ. Several different internal solutions were used, depending on the experiment being performed. For whole-cell voltage-clamp experiments pipettes were filled with a cesium-based internal containing (in mM): 120 CsMeSO3, 15 CsCl, 10 HEPES, 0.2 EGTA, 3 ATP-Mg, 0.3 GTP-Na, 10 TEA-Cl, 1.9 QX314-Cl. For whole-cell voltage-clamp calcium imaging experiments the same internal, absent EGTA, was supplemented with 100 µM Fluo-4 or Fura-2 and 25 µM Alexa 568. For whole-cell current-clamp experiments pipettes were filled with a potassium-based internal containing (in mM): 135 KMeSO4, 5 KCl, 5 HEPES, 0.05 EGTA, 10 phosphocreatine-di(tris), 2 ATP-Mg, 0.5 GTP-Na as well as 25 µM Alexa 568. Perforated-patch experiments were performed with pipettes front-filled with a solution containing (in mM): 126 KMeSO4, 14 KCl, 10 HEPES, 1 EGTA, 0.5 CaCl2, 3MgCl2 and then back filled with the same solution containing 20 µg/mL gramicidin-D. Loose-seal cell-attached recordings were made with pipettes filled with 145 mM NaCl, 10 mM HEPES, and 25 µM Alexa 568 (ThermoFischer Scientific, Waltham, MA). All internals had a pH of 7.25–7.3 (with either 1 M CsOH, KOH, or NaOH) and an osmolarity of 280–300 mOsm/L. Electrophysiological recordings were obtained using a Multiclamp 700B amplifier. Signals were filtered at 4–20 kHz and digitized at 10–50 kHz. For voltage clamp experiments access resistance was monitored throughout the experiment. Cells in which access deviated from baseline by more than 20% were discarded. For perforate patch experiments, cells were left to perforate until the spike height reached roughly 0 mV before data collection began. Rapid jumps in the observed voltage to positive (>0 mV) values were used as exclusion criterion due to break-in. The liquid junction potential for the cesium, potassium, and perforated internals in recording aCSF were 5.9 mV, 7 mV, and 5.1 mV respectively, and were corrected for during data analysis. A number of different pharmacological agents were used. Unless otherwise noted, drugs were purchased from R and D Systems (Minneapolis, MN) or Abcam (Cambridge, MA) and were prepared according to manufacturer instructions. They are listed here, along with their working concentration: NBQX (5 µM), (R)-CPP (5 µM), SR95531 (10 µM), mecamylamine hydrochloride (10 µM), tetrodotoxin (1 µM), 4-aminopyridine (100 µM), apamin (200 nM), ifenprodil (5 µM), TCN 201 (10 µM), A 841720 (0.1 µM), MTEP hydrochloride (0.5 µM), philanthotoxin 74 (5 µM), glycine (250 µM), D-serine (250 µM), CIQ (10 µM; provided the Traynelis lab and Brandt Labs, Atlanta, GA). Two-photon laser-scanning microscopy (2PLSM) was performed using an Ultima LSM system (Prairie Technologies, Middleton, WI). The 2P excitation source was a Chameleon-Ultra series tunable (690–1040 nm) Ti:sapphire laser system (Coherent Laser Group, Santa Clara, CA). Alexa and Fluo-4 dyes were excited using 820 nm (80 MHz pulse repetition frequency and ~140 fs pulse duration) excitation, while Fura-2 was imaged at 780 nm. Laser power attenuation was achieved with two Pockels' cell electro-optic modulators (models M350-80-02-BK and M350-50-02-BK, Con Optics, Danbury, CT) controlled by PrairieView 5.0–5.3 software. The two cells were aligned in series to provide enhanced modulation range for fine control of the excitation dose (0.1% steps over five decades), to limit maximum power, and to serve as a rapid shutter during line scan acquisitions. The fluorescence emission was collected by non–de-scanned photomultiplier tubes (PMTs). Green channel (490–560 nm) signals were detected by a Hamamatsu H7422P-40 select GaAsP PMT, which was protected during blue laser exposures with a Uniblitz DSS10B-1-T-0 shutter (Vincent Associates). Red channel (580–630 nm) signals were detected by a Hamamatsu R3982 side on PMT. Cell visualization during laser scanning was made possible by a Dodt-tube-based transmission detector with a mirror routing the laser to a Hamamatsu R3982 side on PMT (Prairie Technologies; Middleton, WI). Scanning signals were sent and received by the PCI-NI6110 analog-to-digital converter card in the system computer (National Instruments, Austin, TX). Scanned images were built up pixel by pixel (dwell time: 10–12 µs), with PMT anode current to voltage conversion and sampling fixed in 0.4 µs increments. For calcium imaging, line scans were performed along 5–10 µm sections of dendrite (6 ms and 512 pixels per line). Cells were allowed to fill for a minimum of 30 min to allow for dye equilibration. Calcium fluorescence signals were background-subtracted and normalized by a baseline fluorescence (f0). Calcium transients were quantified as the area under the transient. One-photon (1P) photostimulation was performed using either a Prairie Aurora Launch (473 nm, 50 mW rated laser with AOTF intensity control) or a Prairie Helios laser launch (Coherent OBIS 473 nm laser). The launch was coupled to the Ultima scan head via a metal clad fiber optic cable. The launch optics were designed to provide ~1 um spot stimulation at the focal plan of the 60x/1.0NA objective lens; additional optics allowed for this spot size to be increased to ~10 um. Generally, a 1.0ND filter was employed to reduce the maximal power at the sample from ~18 mW to ~1.8 mW. Laser power was further controlled by the PrairieView software. A second pair of galvanometer mirrors within the Ultima scan head allowed for multiple stimulation points within the focal plane of interest. Full-field photostimulation was provided by either a pE-100 470 nm LED (CoolLED via Tek5 Systems, Yorktown Heights, NY) or an Excelitas Excite LED110 four-LED, coupled to scanning system via a Lumatec 3 mm liquid light guide via the Olympus BX-51 WIF rear epi-fluorescence port. For blue-light stimulation, a Chroma 39002 ET eGFP large (BX2) Olympus filter cube was used. The LED was remotely synchronized and activated by a TTL signal from the PrairieView software. The maximum exposure field of view with the 60x/1.0NA objective lens was ~415 µm. For sCRACM experiments, the point spread function of the blue laser was estimated by moving the nominal site of stimulation away from the dendrite (Figure 3—figure supplement 1). Laser power was calibrated based on this same procedure. For RuBi-glutamate uncaging experiments, RuBi-glutamate (2 mM) was superfused (0.4 ml/hr) using a system of syringe pumps (World Precision Instruments, Sarasota, FL) and a multi-barreled perfusion manifold fitted with a small-volume mixing tip that allowed rapid switching between solutions (Cell MicroControls, Norfolk, VA). In all photostimulation experiments, light pulses were limited to 1 ms, with the power calibrated based on achieving physiological responses within the scope of the respective experiment. Fixed tissue was prepared by first perfusing anaesthetized animals with phosphate buffered saline (PBS, Sigma-Aldrich, St. Louis, MO) followed by 4% paraformaldehyde (PFA, diluted with PBS from 16% stock, Electron Microscopy Sciences, Hatfield, PA). The brain was then removed and allowed to further fix in PFA overnight, and then washed and stored in PBS. Brains were sectioned in to 100 µm parasagittal slices on a Leica VT1200 S vibratome. Sections were mounted on with ProLong Diamond (ThermoFischer Scientific, Waltham, MA) and imaged with an Olympus FV10i confocal laser scanning microscope. Both electrophysiological and imaging data were analyzed using either GraphPad Prism (version 5.0, GraphPad Software), Fiji (Schindelin et al., 2012), or custom written python analysis scripts using a number of numerical python packages: pandas (McKinney, 2010), SciPy (Jones et al., 2001), and statsmodels (Seabold and Perktold, 2010). Figures were created with matplotlib (Hunter, 2007) or GraphPad Prism and Adobe Illustrator. The code is available at https://github.com/surmeierlab/neurphys (Galtieri and Estep, 2014); a copy is archived at https://github.com/elifesciences-publications/neurphys. Data were summarized using box plots showing median values, first and third quartiles, and whiskers at 10th and 90th percentiles. Summary statistics are presented as mean ± standard deviation. Sample n represents the number of neurons collected from brain slices from a minimum of three animals. Sample size was based on prior studies published from our lab and others using similar techniques (Blythe et al., 2009; Sanchez-Padilla et al., 2014). Statistical analysis was performed with either SciPy, statsmodels, or GraphPad Prism using non-parametric tests (Mann-Whitney U-test of significance or Wilcoxon signed rank test for between or within-subject design experiments, respectively) except where otherwise noted. To correct for multiple comparisons the Holm-Bonferroni method was used, with the reported p-value representing the adjusted p-value. Probability threshold for statistical significance was p<0.05. Brain Structure and Function 213:247–253. The Journal of Physiology 586:5679–5700. Neurobiology of Learning and Memory 94:229–239. The Journal of Physiology 586:739–750. The Journal of Comparative Neurology 364:254–266. European Journal of Neuroscience 5:137–144. Computer Control of Microscopes Using µManager, Current Protocols in Molecular Biology, John Wiley & Sons, Inc. The Journal of Physiology 592:2059–2078. SciPy: Open Source Scientific Tools for Python. The Journal of Physiology 569:209–221. European Journal of Neuroscience 18:23–33. Annals of the New York Academy of Sciences 1104:310–323. Journal of Computational Neuroscience 28:389–403. The Journal of Comparative Neurology 344:232–241. The Journal of Comparative Neurology 344:210–231. Basal Ganglia Control of Substantia Nigra Dopaminergic Neurons, Birth, Life and Death of Dopaminergic Neurons in the Substantia Nigra, Vienna, Springer . 51–56, Data Structures for Statistical Computing in Python, Proceedings of the 9th Python in Science Conference. British Journal of Pharmacology 113:831–838. The Journal of Physiology 466:727–747. European Journal of Neuroscience 33:1885–1896. Frontiers in Integrative Neuroscience 7:36. Journal of Neural Transmission 123:679–693. European Journal of Neuroscience 32:359–367. Neurobiology of Learning and Memory 131:1–8. European Journal of Neuroscience 30:504–513. Frontiers in Molecular Neuroscience 5:34. Thank you for submitting your article "Pedunculopontine glutamatergic neurons control spike patterning in substantia nigra dopaminergic neurons" for consideration by eLife. Your article has been reviewed by three peer reviewers, and the evaluation has been overseen by a Reviewing Editor and Gary Westbrook as the Senior Editor. The following individuals involved in review of your submission have agreed to reveal their identity: John T Williams (Reviewer #2); Charles Wilson (Reviewer #3). The reviewers have discussed the reviews with one another and the Reviewing Editor has drafted this decision to help you prepare a revised submission. The reviewers and the BRE find that this study describes an important input/ mechanism that could mediate phasic responses of DA neurons in vivo. However, there is no direct testing that the mechanism presented mediates bursting in vivo. Everyone agreed that in vivo experiments, although important, would take too long for this study. So the consensus was not to ask for new experiments, but instead for a change in language so that the paper does not claim that this is the mechanism for DA neuron bursting in vivo. The authors could still suggest that this may mediate phasic responses of DA neurons in the discussion, and also suggest that this is a novel mechanism which may mediate responses to stimuli or movement. This summary should guide your response to the individual reviewer comments. Below are the detailed comments of the reviewers that may help prepare the revised manuscript. In this manuscript, the authors propose that SN DA neuron burst firing is regulated by PPN input, with the SNDA neurons following optogenetic activation of the PPN. The authors further propose that burst firing may be driven in a spike-to-spike manner by patterned burst firing of the PPN. While this is an intriguing finding, the suggestion that this underlies burst firing pattern of SNDA neurons is far from validated. First, with optogenetic stimulation, all of the PPN-SN fibers are activated simultaneously; a situation that does not exist in vivo. Secondly, it cannot account for the ability of NMDA blockade in vivo in preventing burst firing of SNDA neurons. Third, burst firing has never been shown to occur simultaneously across neurons in the SN (which one would expect from a burst PPN input), but occurs with a range of ISIs, burst length, etc. And finally, and importantly, the timing of the burst (length, ISI) of PPN neurons does not follow the characteristics of burst firing in DA neurons, with substantially longer ISIs. Therefore, while this is clearly a powerful and important input that is well-characterized here both anatomically and electrophysiologically, to suggest that it underlies burst firing would require substantially more data, including tonic activation of the PPN (e.g., with DREADDs or pharmacologically), demonstration in vivo that bursting in PPN parallels temporally burst firing in SNC, and the ability to prevent burst firing in vivo (including NMDA-driven burst firing) to be able to support such a specific mechanism. I would suggest the authors focus on the powerful PPN-SNC connection, the extensive characterization of the glutamatergic mechanisms, and its implications for driving normal firing or modulating output, rather than trying to force their data into a tenuous explanation of burst firing that is strongly countered by a rather substantial body of data. Subsection “PPN glutamatergic synapses were capable of spike patterning” – There is an explanation for the truncated action potentials that has been published before. In fact the explanation provided in the next paragraph is identical to that demonstrated 30 years ago. Specifically, it has been shown (see early Grace papers) that antidromic activation of DA neurons often triggers only an IS spike and not a full IS-SD spike. This was shown using in vivo intracellular recording that with somatic depolarization, a full spike is triggered. The explanation is that during normal firing, the soma is first depolarized by the pacemaker conductance, allowing the IS spike to spread into the dendrites to trigger dendritic spiking. However, with AD, the soma is hyperpolarized, and the is spike cannot spread to depolarize the dendritic tree. This manuscript describes the glutamate input from the peduculopontine nucleus (PPN) to dopamine neurons in the substantia nigra compacta in the mouse. Whole cell, perforated patch and loose cell attached recordings were made in combination with optogenetic activation of PPN axons, electrical stimulation and glutamate uncaging to pharmacologically define the subunit composition of the AMPA and NMDA receptors. The results show that GluA2 containing subunits make up AMPA receptors and NMDA receptors contained GluN1, GluN2B and GluN2C/D subunits at this synapse. The most interesting observation is that the inputs from PPN more or less selectively innervate the cell body and proximal dendrites. This pattern of innervation resulted in reliable activation of action potentials in the axon and cell body. The conclusion was that the AMPA receptor activation arising from the PPN alone is capable of driving burst activity in dopamine neurons. 1). This is a concise manuscript that describes comprehensively one key excitatory input onto dopamine neurons in the substantia nigra. As such this is an important contribution. 2) The experiments use appropriate methods and the results support the conclusions. 3) A series of important controls are included that support the most interesting observation that the inputs from the PPN selectively innervate proximal dendrites and therefore are key regulators of soma/axonal excitability. As far as I know, this is the first demonstration of a selective distribution of excitatory afferents on dopamine neurons and is an important observation. This is an original and unexpected finding on the synaptic origins of burst firing in the dopaminergic neurons of the substantia nigra. Studies in vivo had implicated NMDA receptors as essential, but were not successful at determining the nigral afferent pathway that was directly responsible for bursts. It is important because burst firing in dopaminergic neurons has been hypothesized to be a final common pathway for the internal model of reward prediction. It seems unlikely that the dopaminergic neuron receives direct sensory and memory-related inputs required to synthesize a reward prediction. It is usually assumed that these signals are synthesized elsewhere and combined at the level of the dopaminergic neuron. This paper suggests that the actual combination of sensory and memory information may occur at an even more unexpected location, pedunculopontine nucleus of the pontine reticular formation. The experiments use optogenetic activation of afferents from the pedunculopontine nucleus to trigger bursts in dopaminergic cells. The authors do a good job of verifying their stimulus and characterizing the contribution of the various glutamate receptor subtypes. A key part of the finding is the demonstration that the synapses responsible are located proximally. For this they use focal optogenetic stimulation. They argue that the proximal location of the synaptic input is key for the generation of burst firing, because fast proximal synchronous activation of the synapses could drive spiking at high frequencies. Spikes could be driven with this stimulus at rates and in patterns that could not be followed by the entire somatodendritic membrane, suggesting that the proximity of the input to the axonal spike generator allowed firing at rates the soma could not sustain. They showed that these partial spikes were propagated down the axon. But it was surprising that fast spiking driven by this stimulus did not depend on NMDA receptors. The experiments are well designed and skillfully executed. The figures and the writing are very clear and illustrative. I think the paper is very convincing. My only concern is that the authors don't explain how a burst in vivo can actually be generated in their scheme. It seems essential that the neurons in the pedunculopontine nucleus fire in synchrony at high frequency, in a style similar to that used in the experiment, to drive a burst in the dopaminergic neurons. The dopaminergic neurons under these circumstances should also fire synchronously. Is this what happens? Or could single PPN neurons fire bursts which are sufficient to trigger identical bursts, spike-for-spike in some small subset of dopaminergic neurons. In that case asynchronous bursts in PPN neurons could produce asynchronous bursting in the SNC. But then single PPN neurons must be effective at triggering spikes. Is there any indication of how powerful a single PPN neuron is? One implication of this that the authors do not discuss is the function of the dopaminergic neuron in burst formation. This is, of course, the reason for studying all this in the first place. Their scheme seems to make the dopaminergic cell a mere relay for reward-prediction bursts generated in the PPN. This of course does not explain how the brain can do reward prediction, it merely passes the buck to the PPN. How closer does this get us to understanding reward prediction? Can the PPN synthesize reward prediction error? It was not our intention to give the impression that we were describing THE mechanism responsible for burst spiking in vivo. The current view of burst spiking in SNc DA neurons is that NMDARs are necessary. Our point was simply to provide an example where this wasn’t the case. In the revision, we have attempted to make this point clear and to underscore the limits of our experimental approach. In this manuscript, the authors propose that SN DA neuron burst firing is regulated by PPN input, with the SNDA neurons following optogenetic activation of the PPN. The authors further propose that burst firing may be driven in a spike-to-spike manner by patterned burst firing of the PPN. While this is an intriguing finding, the suggestion that this underlies burst firing pattern of SNDA neurons is far from validated. First, with optogenetic stimulation, all of the PPN-SN fibers are activated simultaneously; a situation that does not exist in vivo. Optogenetic stimulation induces synchrony in a subset of PPN axons; it does not activate ALL PPN axons. Nevertheless, it is true that it does induce a degree of synchrony that is unlikely to occur in vivo. But, this is also true other methods that have been used to probe the mechanisms controlling spike generation in SNc neurons (e.g., iontophoresis of glutamate or electrical stimulation of afferent fibers). As shown in Figure 4 Supplement 1, we attempted to alleviate this concern by grading the optical stimulation intensity to estimate the extent of the PPN fiber recruitment that was necessary to reliably evoke spikes. As seen in this figure, this relationship was very steep and plateaued at low photon doses, suggesting that only a relatively small number of fibers was necessary for spike generation. The revision has been edited to make this point more clearly. 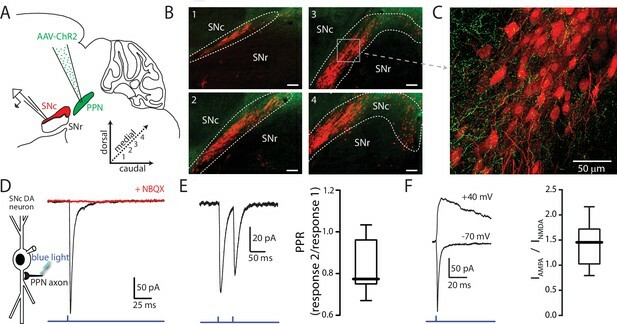 More importantly, the paper makes the point that PPN synapses have the potential to control the spiking of SNc neurons by virtue of their preferential, proximal dendritic location, near the axon initial segment; this positioning allows them to produce burst spiking without NMDARs. Secondly, it cannot account for the ability of NMDA blockade in vivo in preventing burst firing of SNDA neurons. The available evidence suggest that NMDAR blockade or genetic removal reduces, but does not eliminate burst spiking in SNc DA neurons of mice in an open field. There is no compelling evidence that NMDAR blockade affects burst spiking generated by salient or rewarding stimuli. In fact, the work of Zweifel et al,. (2009) argues that many behaviors that recent work has shown to be correlated with burst spiking in SNc DA neurons – like the initiation of movement (Howe and Dombeck, 2016) – are unaffected by genetic deletion of NMDARs. Our view, which has been significantly expanded in the revision, is that there are several ways in which bursts are generated in SNc DA neurons. What our work does it to broaden this ‘burst canvas’ to include NMDAR-independent mechanisms. Again, this does not exclude NMDAR-dependent mechanisms. Third, burst firing has never been shown to occur simultaneously across neurons in the SN (which one would expect from a burst PPN input), but occurs with a range of ISIs, burst length, etc. There is no reason to think that all of the glutamatergic PPN neurons spike in synchrony. If only a few PPN neurons control each SNc DA neuron, then there can be a high degree of heterogeneity in the burst spiking of SNc DA neurons. This point is made in the revision. And finally, and importantly, the timing of the burst (length, ISI) of PPN neurons does not follow the characteristics of burst firing in DA neurons, with substantially longer ISIs. While the observation made by Pan and Hyland (2005) indicate that PPN neurons fire at much higher frequencies in response to sensory cues than do SNc neurons, work by others has shown a much closer overlap in the spiking patterns of PPN and SNc neurons encoding predicted rewards and reward delivery (Hyland et al., 2002; Kobayashi and Okada, 2007; Okada et al., 2009; Hong and Hikosaka, 2014). That said, given the uncertainty about the extent of PPN axon convergence on SNc DA neurons, there need not be any relationship between burst patterning in PPN and SNc – other than onset. Again, we have attempted to make this point in the revision. Therefore, while this is clearly a powerful and important input that is well-characterized here both anatomically and electrophysiologically, to suggest that it underlies burst firing would require substantially more data, including tonic activation of the PPN (e.g., with DREADDs or pharmacologically), demonstration in vivo that bursting in PPN parallels temporally burst firing in SNC, and the ability to prevent burst firing in vivo (including NMDA-driven burst firing) to be able to support such a specific mechanism. I would suggest the authors focus on the powerful PPN-SNC connection, the extensive characterization of the glutamatergic mechanisms, and its implications for driving normal firing or modulating output, rather than trying to force their data into a tenuous explanation of burst firing that is strongly countered by a rather substantial body of data. SNc DA neurons receive glutamatergic input from several sources other than PPN: cortical pyramidal neurons, subthalamic nucleus neurons, superior colliculus neurons to name a few. We make no claims about the ability of these inputs to generate NMDAR-dependent bursts. Our only point is that PPN synapses, by virtue of their unusual positioning close to the axon initial segment, are capable of patterning spiking in SNc DA neurons without the engagement of NMDARs. Previous work (Grace and Bunney, 1983; Häusser et al., 1995; Blythe et al., 2009) is consistent with this proposition. We appreciate the reviewer pointing out this reference. It has been added to the revision. However, it is important to point out that what was shown in our paper were synaptically generated, orthodromic spikes, not antidromically evoked spikes. Moreover, the IS-SD spike differences with antidromically evoked spikes was shown much earlier in other neurons by Eccles and colleagues. We thank the reviewer for their time in evaluating our work and for their supportive comments in response to our presented findings. First of all, we thank the reviewer for their encouragement and positive comments. Second, the reviewer raises an excellent question – one for which we don’t have an answer. We’re grappling with strategies that would allow us to get at an answer but we’re not there yet. What we have done in the revision is raise the broader question in the Discussion section and pose some potential strategies for answering it. A very insightful and intriguing set of questions – questions that we don’t have answers to. That said, we can speculate. PPN neurons likely provide information about stimulus salience, actual reward presentation and movement initiation to the SNc. These are all events that have been reported to generate SNc bursts. Recent work has shown that SNc DA neurons transiently fire at the onset of movement (Howe and Dombeck, 2016). Cells within the PPN have been shown to also fire prior to movement, with many cells showing directional preference (Thompson and Felsen, 2013). Glutamatergic cells in the PPN have been particularly tied to the role PPN plays in locomotion, with basal ganglia circuits being implicated as regulators of these cells (Roseberry et al., 2016). What is less likely is that PPN provides a reward prediction error signal, as PPN neurons continue to respond to fully conditioned stimuli, regardless of prediction error (Dormont et al., 1998; Kobayashi and Okada, 2007; Okada et al., 2009). This distinction is made in the revision and underscores the heterogeneity in burst generation and SNc signaling. This work was supported by grants from the JPB Foundation, the IDP Foundation and NIH (NS 047085). We thank Dr. Harini Lakshminarasimhan for her technical assistance with the fixed-tissue imaging and Sasha Ulrich, Danielle Schowalter, and Marisha Alicea for their management of the various mouse colonies used here. Animal experimentation: All experiments were performed in strict accordance with the guidelines set by the Guide for the Care and Use of Laboratory Animals of the National Institutes of Health. All animals were handled according to approved Institutional Animal Care and Use Committee protocols (IS00001185) of Northwestern University. All procedures were performed under isoflurane or ketamine/xylazine anesthesia, and every effort was made to minimize suffering. © 2017, Galtieri et al.